SCIENTISTS investigating a giant squid in front of an internet audience have found that the huge beast may only be a minnow compared to others in the ocean. 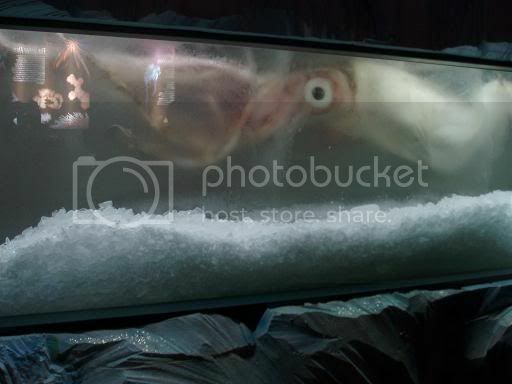 The squid has been thawing from a block of ice in front of four live webcams at The Museum of New Zealand in Wellington. An international team of scientists will examine it in more detail today. The specimen, scientifically known as a colossal squid, is the biggest ever caught, at up to 10 metres long and 495 kilograms. It boasts a fearsome beak and razor-sharp hooks, and has eyes the size of dinner plates. But that may be relatively small, scientists say after initial examination, suggesting other colossal squid (Mesonychoteuthis hamiltoni) under the chilly Antarctic waters might grow much larger. On a museum blog following the progress of the thaw, Chris Paulin - who is projects manager at the museum, known as Te Papa Tongarewa, said that the beak of the colossal squid has been exposed as the flesh defrosts. The size of the lower beak — used to chop prey into bite-sized pieces — is around 43 to 45 millimetres. Colossal squid lower beaks previously found in the stomachs of sperm whales have been as long as 49 millimetres. Extrapolating the relationship between the length of the beak and body size from another smaller specimen being examined suggests the species could grow much bigger, Mr Paulin said. "Can we assume that this species reaches three quarters of a tonne in weight?" he asked. One of the scientists leading the examination, Auckland University of Technology squid expert Dr Steve O'Shea, said it was difficult to say how much bigger the monster squid could grow. "What we know from that one measurement is that the beak of this animal from the stomachs of sperm whales are considerably larger," Dr O'Shea told Radio New Zealand. "We make the leap to say the colossal squid grows considerably larger than the 495 kilogram one we are currently defrosting." Dr O'Shea has previously described the colossal squid, which has razor-sharp swivelling hooks at the end of its tentacles, as "a nasty aggressive sort of squid... a gelatinous blob with seriously evil arms on it." If the new specimen was cut into squid rings, they would be size of tractor tyres, although they would taste like ammonia. The colossal squid was caught as it ate an Antarctic toothfish hooked on a fishing boat's long line in Antarctic waters in February last year. After being snap frozen, it was given to the museum, which has since been deciding the best way to defrost, examine and display it. Suggestions such as using a giant microwave to unfreeze it were discarded, and on Monday the squid was placed in a tank filled with cold salty water to ensure it defrosts slowly without decomposing. The squid is so large that there was a risk the outside flesh would start to rot before the inside had thawed. Defrosting is due to finish today when scientists will learn as much as they can before the squid is preserved in formalin to go on show in a massive tank at the museum later this year. The progress of the thawing is being shown live by webcams on the museum's website www.tepapa.govt.nz. I guess you think that since I'm reading the Zefrank board I have nothing better to do than watch a squid melt. I thought it was a cephalopodian day spa!!! With Dead Sea salt scrub...? Yes, but what if the colossal squid casts his gaze on you? Holy freakin hell. Yup. Thanks for that. Okay, the vampire moths over in the study hall I could believe, but now National Geographic is just making sh** up. the christmas siphonophore pays a visit ... a bioluminescent deep-sea siphonophore — an eerily fantastic creature that appears to be a single, large organism, but which is actually a colony of numerous individual jellyfish-like animals that behave and function together as a single entity.